Has this ever happened to you? You’re at a cocktail party, swirling your perfectly aged chard, and someone saunters up to you and asks what you do. “I’m in content marketing,” you say with an animated twinkle in your eye. The reaction? A blank stare. If you’re lucky, you might get a, “Oh, how nice for you.” Or, the worst—the look of complete and utter boredom. It stings a little, huh? After all, content marketing is the center of the world as far as you and I are concerned. We know the power of a solid content marketing strategy. We bleed authenticity, relevancy and good content for all. But content marketing is, in many ways, still new on the scene. It’s a mere bullet point in many a traditional marketing plan. And to explain it to the typical business owner or professional outside our world, you need the strength and stamina of a superhero. We can do this. Here’s the plan. The first rule of explaining content marketing is to practice talking about content marketing. Get a definition in your head you’re comfortable with and work it until it rattles off your tongue. A marketing technique of creating and distributing valuable, relevant and consistent content to attract and acquire a clearly defined audience—with the objective of driving profitable customer action. A solid start, but challenging to spout off after a glass of that well-aged chard. Say it a few times aloud and then put it in your own words. Content marketing is a way to attract new people to your brand through educational, entertaining content—usually on your site’s blog. The goal is to create a relationship with potential new customers or clients. Your next step is hitting home the point that content marketing is a powerful tool in getting website traffic. You’ve spent all that money on a shiny new website. How do you plan to leverage it? Most people would answer: SEO (even if they’re not exactly sure what it is). Anyone within ear range of a marketing department has heard this term. They know it’s important. Content marketing is posed to trump traditional SEO marketing in garnering site traffic. The goal of content marketing is to build a relationship with a relevant audience. The blog is the heart of your content marketing platform. Social media and email are your primary content amplification tools. You can mention other content opportunities like ebooks and case studies, but tread slowly. The next hurdle is nailing the “What’s in it for you,” and this is your chance to pull out the big guns: the customer journey. This is exciting to most people, especially small business owners, if you can boil it down to the essence of why it matters. People love pictures, especially at cocktail parties. The goal of content marketing is to engage, start a conversation, build trust and inspire people at the top of the funnel to move further down toward the loyal customer stage. If you can hit that point home, you’re nearly there. Or, my favorite: “I publish a blog post every day. My SEO guy told me to.” That one’s just scary. So here’s where you get ’em thinking. Why do you blog? What type of content do you create? Is it self-promotional? Or do you create content that’s helpful to your audience? Who is your audience? Personas: A definition and profile sketch of the audience we want to attract. Content types: What does our audience want? Education, entertainment, enlightenment. Publishing schedule: Consistent calendar of posts. 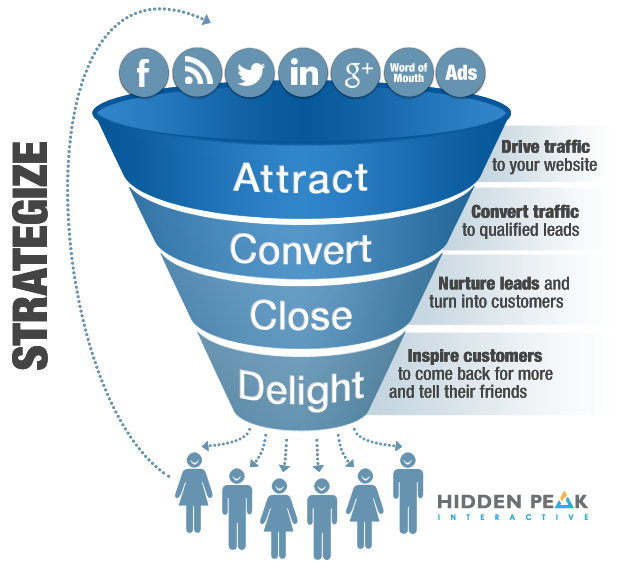 Promotional strategy: Email, social, strategic relationships to drive inbound links. This is the stage where you really needle into the importance of the blog. Depending on who you’re talking to, the term “blog” has different meanings. Make the point that the brand blog is where all this good mojo happens—if done right. For a blog to be effective, it must be nourished with a steady stream of educational and/or inspiring/entertaining content that draws in fresh, curious eyeballs of those interested in your vertical. Whole Foods Blog: Whether you love, hate or love to hate Whole Foods, their blog hits a home run. In between recipe posts with tantalizing photos of flourless chocolate cakes and cheesy dips, they intersperse stories about quality standards and low-sodium options. The message is that they’re there to help. Patagonia’s The Cleanest Line Blog: Sometimes blogs jump the line of weblog into lifestyle magazine. The Cleanest Line does that well. This is a blog that embraces all aspects of the outdoor lifestyle. It’s not about the clothes. HootSuite Blog: OK, so maybe it’s not the sexiest blog, and you won’t find any photos of delicious cheesy dips or chocolate-dipped confections, but you will find really good, instructional content. The posts are resourceful, educational and developed to help their core audience understand and implement quality social media outreach. So that’s the skinny. Next time you’re at a cocktail party and get that blank stare, whip out your customer journey funnel graphic and let us know how it goes. Relaxation curator, travel book author, writer, editor, dog lover, samurai.